Ideal recipe for: Those who want to lose weight or anyone looking for a quick & healthy breakfast. Fun fact: Some years ago, nutritionists recommended eating carbohydrates at breakfast. However, it has recently been proven that consuming a mixture of proteins, healthy fats and fiber that barely contain sugar is much more efficient in weight loss. A breakfast of yogurt with fruit, a little cereal and sweetened with honey is perfect: rich in protein, vitamins, minerals and fiber. So, if you are looking to shed a few extra pounds, then this is the perfect way to kick-start your day! 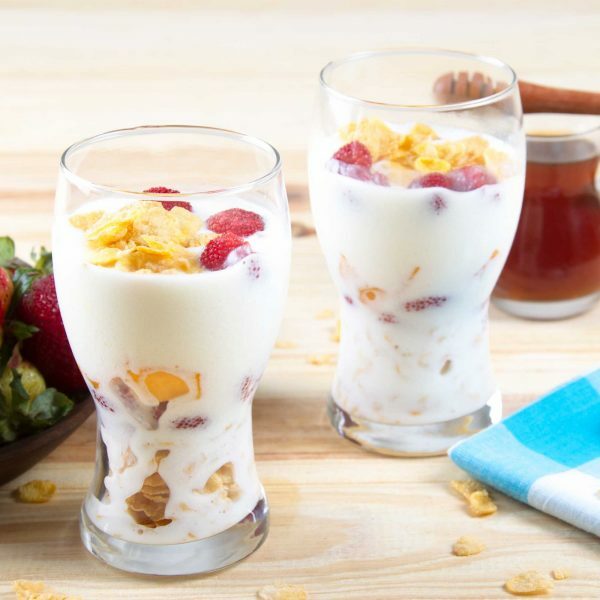 Serve alternating layers in a clear glass: first the cereal, then half the berries and cover with yogurt. Repeat this operation once more, let it rest 10 minutes and enjoy a delicious Greek yogurt parfait. And you are done! So easy, right? Below is a break down of all the good stuff your body will be getting from this recipe.